Rain, sleet or snow isn’t stopping engineers from driving the C8 Mid-Engine Corvette during these winter months in Michigan. This sighting comes from Corvette_Nut at the Corvette Forum who says the photo was captured Friday in Auburn Hills, MI. We do know the Corvette team enjoys driving their sports cars all year around as Harlan Charles had demonstrated previously with his 2019 Corvette ZR1 in the snow. The Corvette Team is showing a lot of confidence in those Michelin all-season tires, but just in case they do have a rear tow hook installed. 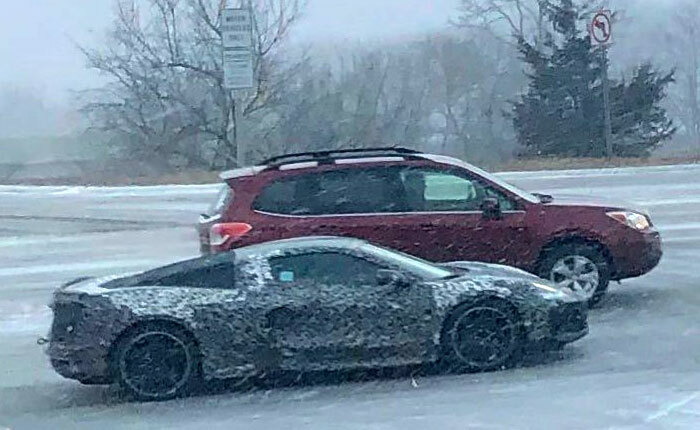 [SPIED] The Mid-Engine Corvette Zora Exists!! !